WARNING: this treatise does not refer to valves, vinyl, or cuddly audiophilism. In fact it is quite non-TNT-like. But all the same, the events described here were exceedingly positive for my musical life. Thirty months ago we purchased an old house, conveniently located 200 meters from where we lived. Amongst the motivations was that this new and much larger house would allow me to have my own music room. With it came a total and extremely frustrating, even painful, renovation process. I've met and worked with a number of decent and very helpful contractors, but there were also a number of characters I only see fit for retiring in unsettled concrete. But as they say challenges are also opportunities, and there was now the chance of doing things the right way. What this means for the fabled music room and its acoustics I may report in a separate article. Right now I am going to explain how this affected my actual system. Or rather systems. There has been some sort of explosion, lately. In the old house we had an 8 x 4 m lounge, making a large 'L'-shape with a 7 x 4 dining room and open kitchen. The narrow front end of the lounge had all of the system, firing down the length. There were no 21st century gizmos: a standalone stereo system, a CRT television setup, and just a single toslink between the main system's Apogee DAC and an SPDIF switch at the TV. Connected to that switch were a DVD/HDD recorder and a Western Digital TV Live media player, with content on a local USB drive. There was no digital cable TV, no wired ethernet, and WiFi only during the last months of our living there, and that not even reliably reaching from the home office (a converted garage) to the lounge. The new house all changed that, thanks to more rooms and more infrastructure. We brought TV coax in many rooms, all leading to a central patch bay in the cellar. There are also two separate ethernets, one CAT5, the other CAT6, both leading to all relevant rooms, and then there is WiFi. Why two wired nets? The CATV providers in Flanders use two different systems. One is telephone-oriented, with ADSL. It is technically clumsy and challenged. The other builds on the old analogue coax backbone, is more advanced and more reliable (in my perception). That's what we have. It requires signal splitters, modems, amplifiers, and whatever at a central location (our dungeon), and then a coax cable plus an ethernet cable to each end point (i.e. decoder/recorder plus TV screen). The ethernet link is there for interactive TV content, and also for making separate decoders and recorders talk to each other, allowing the streaming of recorded content all over the house. Thus with the promise of a lot of network traffic related to television and mostly managed by the CATV provider's gear and policies, which I don't trust, I quickly settled for a separate network just for that, and another network for my own computers and media applications. In-between the two is a router with firewall, and the only traffic between the two is confined to internet access. The most effort was poured into thinking about the office and lounge. The former would get one or two NAS drives on a shelf, mainly as file storage for the house's various PCs and laptops, and perhaps a WiFi access point, although I'd rather avoid one, reducing the risk for interference with the main stereo system. 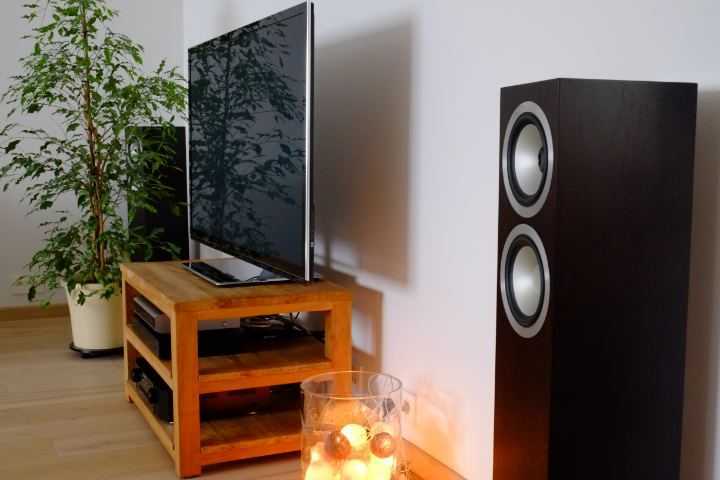 The lounge plans were centered on something like a 1000 Euro Denon AV receiver, matching Blue Ray player, small but beautifully-formed tower and surround speakers from ProAc, Spendor, or Neat, and a Mac Mini with large HDD for locally-stored movies and internet access, running a 10-foot interface. Further associated wireless keyboards, rodents etc. etc. Not fundamentally different from the old-house situation, except for the addition of a full-blown computer and of course the escalation towards another expensive-system-arms-race. If you, reading this early in 2013, think this unfashionably cluttered then you are right. Progress is fast, streaming from a remote UPnP/DLNA server became the new thing, and my plan quickly lost its appeal. Learning, end of 2011, that contemporary Blue Ray players included streaming facilities I started investigating these, only to find that their support for various file types, for subtitles, and overall UPnP/DLNA reliability were less than sketchy. I was also feeling less and less comfortable with the prospect of spending many thousands on what was to be a very simple and accessible family system. And, of course, the number of boxes had to be reduced: these things were to be in plain view. The arrival of an iPad at the old home, and its immediate adoption by all in the family established that there really was no need for internet-on-TV, so the idea of a Mac Mini and all of its paraphernalia was happily dropped. Video streaming would remain a job for the WD Live, fed from files stored on the office NAS. Exit some boxes. It also became clear that a WiFi-less house would be unfeasible, so a well-located access point became a necessity. On the audio front, my positive experience with the Tannoy DC4 mini speakers made us investigate a complete DC6T/DC4LCR/DC4 solution. A mildly-creative session with Photoshop indicated a very good visual match of the 'Espresso' veneer with our ordered oak flooring, so an order was placed. Yes, without auditioning. This lot cost about as much as a single pair of ProAc Studio 130s or 140s. Without doubt the ProAcs would sound better, but the Tannoy DC6Ts really are good enough, if not as magical as the DC4s. I found this at delivery, testing with my 25 years old Cyrus One. Oh, and a dirt-cheap Pioneer BD player. We were economising, and it showed. The next stage was the purchase of televisions. I always adored Pioneer Kuros, unavailable since Pioneer wisely withdrew from the plasma market. Panasonic bought the related assets, and as it happened our planned house move nearly coincided with the local launch of the new 50s series, TVs that already were getting brilliant reviews all over the world. We settled for a 50" GT50 in the lounge, and a 42" ST50 in the music room. The latter is extremely good value for money! The TVs can also act as music renderers. As you remember music streaming was not on my initial requirements list, but with the capabilities now at hand it was easy to build a quick prototype system, just to see what it was all about. I copied my existing iTunes library to the NAS, and connected the music room television to the Apogee DAC and main system. It was running within minutes, and I was hooked within seconds, spending a few hours non-stop browsing and playing. Yes, with MP3s, in a unfinished, untreated, harsh room... I admit to having been totally deprived of music in the past two years; that may have played a role. Still, it dawned on me that despite an earlier total lack of interest, music streaming would now get an important role in our home. What this meant for the music room I'll explain in a later installment. Or did it? 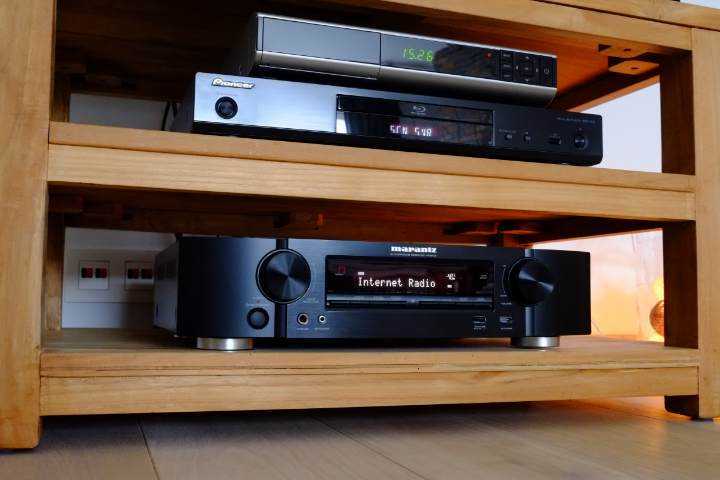 Marantz have a slimline component series. Not very serious, surely? But looking at the NR-1603 it appeared not too far behind its larger brethren from Marantz and Denon. I rolled the dice, bought one. Connected to the ESL-63s it sounded, erm, uninspiring. But with the Tannoy DC6Ts it is more than adequate. In fact some musical joy can be had with this combination! It is well-equipped and even contains yet another UPnP/DLNA music streaming client, as well as Apple Airplay compatibility. Just some examples, for your learning. The QNAP 219Pii NAS is advertised as 'quiet'. It may be, but on our open-plan ground floor this is not silent enough. In the home office, with the harddiscs off and just the fan running (which insists on doing this a lot of the time), you could detect it as far as in the kitchen. That is with lounge and dining room in-between. Having a mild case of tinnitus and two active children I already have plenty of noise to carry around, no need for another source! So the QNAP was unceremoniously moved to the basement. It can do whatever NASses tend to do there, as long as it keeps its hands off the wine. Another gremlin was more intractable. When you switch on either Panasonic plasma, it takes a few seconds for it to detect the media server on the network. But slowly this time grew, until the 50" TV took tens of seconds, and the 42" totally failed to find Twonky. Yet, both TVs showed ready access to internet, and both could be pinged from my PC. It took a while, it took kilometers of running around with a grim face (all that gear distributed over all those rooms), but we got it. Router in lounge, configured as wireless access point, including wireless DLNA/UPnP streaming to the main TV (it is only 20 cm!). It also acts as a wired switch for the surround sound receiver and, if needed, the BD player. In the office a switch connected to various computers. 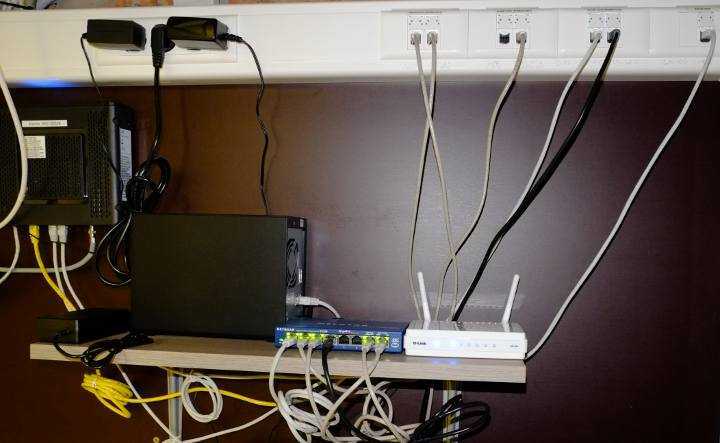 The cellar router acts as firewall between the CATV's 'dirty' CAT5 network, and the private 'clean' CAT6 computer/media network. It also acts as DHCP server for the latter, dynamically assigning IP addresses to all end-points (more on that later). After two days of debugging the TV streaming thingy (my wife contemplating divorce, as if that would help), I eventually power-cycled the router ... and all was well again. It seems that its in-built switch was not happy passing UPnP all of the time. The solution was simple: another (cheap) switch was installed in the cellar, between the router/firewall and the rest of the CAT6 network. Now the router only has to cope with IP address serving and internet traffic. It is oblivious to the rest of the network activity. Since then the network's performance has been impeccable. A smaller issue had to do with IP address assignment. Normally a homeperson would use DHCP, letting the network figure itself out. But Twonky Mediaserver on the NAS automatically assigns specific client profiles for each media renderer it encounters on the network. These profiles carry information to assist the DLNA streaming. In my case Twonky reports two Panasonic Viera TVs and one generic streamer. This is cool, but Twonky attaches the profiles to IP addresses. And IP addresses, thanks to DHCP, are dynamically assigned, and re-assigned. Before you know Twonky ends up thinking that an iPod is a plasma TV. So I now run a network with fixed, administrator-assigned, IP addresses for all of the network backbone (routers, NAS) and all of the media renderers, and DHCP-assigned addresses for all computing devices (PCs, portables, tablets, pods). Again, this seems to be a stable configuration. But let's get back to music. The main requirement for the lounge was easily-accessible background music, so I copied my existing iTunes library, with AAC and MP3 files, to the NAS and let Twonky Media serve it up to the Marantz. The iPad had to serve as remote controller. The obvious app to start with was Marantz' own. This indeed found the server and allowed playback of the files, but album track ordering was messed up, and more importantly, whenever the iPad's focus was not directed at the Marantz app, for instance because another app was running in the foreground, or the iPad simply went to sleep, streaming halted at the end of the present track, and nothing could be done to revive the process. Also missing was automatic leveling of the track-to-track volume, such as iTunes' Sound Check or Replay Gain. The NAS software includes a third-party iTunes server, but this happened to be terminally obsolete, no longer compatible with recent-day Appleware. Apparently an open-source alternative exists, but the NAS is our main file storage, and I really don't feel confident messing around with it, the more as the documentation accompanying the software is very terse. Clearly there was not much fun to be had this way, and ultimately I resorted to copying the background collection as associated playlists to the iPad itself, then streaming it wirelessly with Airplay to the Marantz. This is a kludge, entirely obliterating the purpose of the NAS!!! But it works to satisfaction. Still, it was clear that such a scheme would not make me happy in the music room. Another solution was called for, but at this stage I was not sure how it would end.